When putting a commercial loan together, it’s best to be prepared before you enter into an agreement. The Commercial Loan Document Checklist is a good way to prepare all of the documentation you will need to apply for a loan. Use this checklist to keep track of your loan package and assure a timely and smooth submission. Download the template using the link below and open it in Excel. 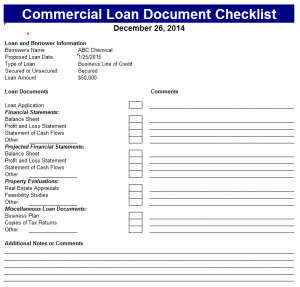 The datasheet is a pre-made checklist for all documentation and notes needed for a commercial loan. Begin by updating the date at the top of the page to the current date. The first section details the basics of the loan including the amount, date, and borrower. Fill this in to your best knowledge and move down to the list of documents. The proposed list is not one of requirements, but recommendations to best get a loan secured. Checkmark the boxes next to documents you have filed and ready to be presented, and mark down any comments needed on locations, explanations, or other notes about a document. Utilize the “other” category for any additional information your bank requests. Begin assembling the documents needed weeks before you apply for the loan. The better prepared you are, the more likely you are to get a good loan. Keep only one copy of this document checklist. Having multiple people with the checklist can mean some people checking off items that others may miss. Contact the loaner ahead of time and get an official list of documentation needed for commercial loans.